He stepped outside and gazed at the clear blue sky framed by stucco and brick buildings in various states of repair. A group of children played fútbol down the dusty block, their clothing ragged and their faces dirty. His heart went out to them. He had been like them once, one of los desechables—the disposables—impoverished and starving, barely surviving his life on the streets spending much of his time looking for ways to get food or money. Then he had been taken by the Fuerzas Armadas Revolucionarias de Colombia, and his life had become a waking nightmare. Those years before he’d been left for dead were the reason he worked so hard to keep the street children out of the hands of the FARC. Mateo drew in a deep breath of cool air to clear his mind of the memories of his teen years. 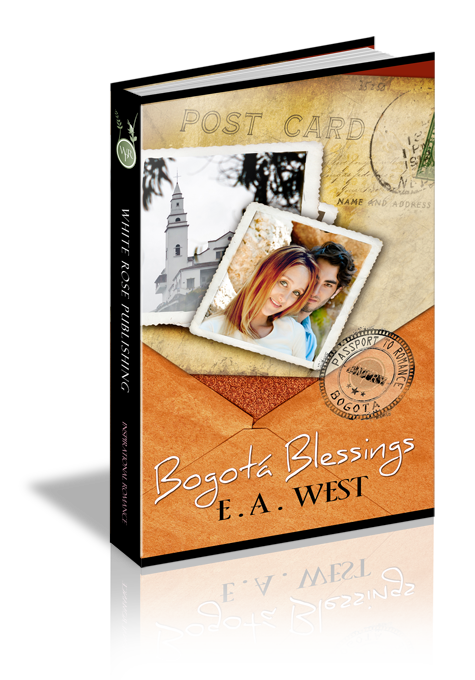 The FARC was in his past, and God had forgiven him for the things he had been forced to do. What mattered now was helping to insure the street children of Bogotá were given the best opportunity to survive and possibly, by some miracle, even thrive. He headed toward the group playing fútbol, regulars at the mission. They grinned and ran toward him, their game forgotten. Reaching into his pocket, he pulled out a handful of hard candy in distinctive green wrappers with yellow letters. “Is this what you’re hoping for?” Mateo said, showing them the coconut-flavored sweet he carried everywhere. “Please, Mateo, may we have a piece?” one of the boys asked. “I have enough for all of you.” He passed out the candy, then unwrapped one and popped it in his mouth. The sweet coconut flavor took him back to the first time he had entered the mission as a seventeen-year-old on crutches, barely healed from a surgery that saved as much of his left leg as possible. Maria had welcomed him warmly and given him a piece of the coconut candy to keep him occupied while he waited for Carlos to arrive. A tug on his sleeve brought Mateo back to the present, and he looked down to find Claudia standing beside him, her hopeful brown eyes peering out of a dirt-smudged face. The six-year-old was one of his favorite regulars at the mission, and her sweet smile had melted the heart of more than one volunteer. “Thank you, Mateo,” she said with a shy smile. Then she darted away, presumably to find her nine-year-old brother, Juan Miguel. The two children claimed to live with relatives, whose supposed relationship to them changed with great regularity, but no one from the mission had ever seen evidence of an adult presence in their lives. The fútbol game resumed, and Mateo headed for the parking lot behind the mission. He would love to save every needy child, with or without family, but it was an impossible dream. The best he could do was brighten their lives with a little candy now and then, share the love of Christ with them, and help however many children he could. If by doing that he kept even one desperate youngster from voluntarily joining the FARC for the promise of three meals a day and two sets of clothing, he would consider it worth the heartbreak of seeing so many kids suffer in extreme poverty. Passing through customs was a breeze, thanks to Shaw Restoration’s excellent reputation, local connections, and attention to detail in all the travel arrangements and paperwork. Kayla Shaw adjusted the straps of her backpack, then hefted her suitcase and followed the other two members of the team toward the exit. The number of armed soldiers in the airport was a little disconcerting, but Kayla knew they were there to protect the passengers and the people picking them up or dropping them off. “My dad said the pastor in charge of the mission and his wife will meet us. Since I’ve never seen them, I’m hoping they’ll have a sign of some sort so we can identify them.” Kayla scanned the crowd, but didn’t see anyone who appeared to be the Ramírez couple. They stopped near the exit and gathered around Kayla. She looked into the tired faces and wished her father had chosen someone else to be the fearless leader of the group, someone with more international travel experience. Maybe even someone from the Bogotá or Cartagena office. But he’d given her leadership, since he’d been unable to come on the trip himself. Something about a member of the family being the best person to represent the family business. All she knew was that she had no idea what to do now that it appeared their ride had forgotten to show up. She’d been warned against using any kind of public transportation, but her father hadn’t given her a back-up plan in case of emergency. Perhaps she could call the Bogotá office to see if they could send someone to pick them up. Kayla’s gaze drifted to the door as an older woman hurried in with a piece of cardboard in her hand. The woman looked over and held up the sign with a questioning look—Shaw Restoration. “I understand,” Kayla assured her. As soon as Kayla saw the rusty, ancient bus with the mission name scrawled in faded blue paint across the side, she completely understood why Maria had been late. The vehicle looked as if it would take a miracle to get it to run, and Kayla made a mental note to contact the missions committee of the church she attended with her father. Perhaps they could raise enough to fix up the bus or possibly buy a newer one. The mission needed reliable transportation, and their current bus appeared to be far from it. A swarthy-skinned man stepped out of the open door of the vehicle, and Kayla’s heart leapt into her throat. His dark, brooding eyes scanned the group, his stance wary as he took them in. A scar down the left side of his face made him look even more menacing than the heavy, dark stubble shadowing his face. As they followed him, Kayla noticed a slight limp in his walk. She felt a small twinge of guilt for judging him by his appearance alone. Since he worked for the mission, he was probably a very nice guy, even if he did look as scary as the rebels she’d seen in news reports. Perhaps his limp had been caused by the violence that had gripped Colombia for several decades. That could explain his wariness and the scar on his face as well. Still, a little wariness of her own until she knew him better wouldn’t be amiss. Luggage loaded, they boarded the bus and it started with a groan of protest. Maria kept up a running commentary on the passing city, but Kayla couldn’t focus on it. Mateo kept looking in the rearview mirror, his gaze locking briefly onto her before returning to the road once more. His interest was disconcerting, and she hoped she wouldn’t have to see him too often. Nice guy or not, the man gave off some kind of mysterious vibe that left her wondering just how many skeletons he had hidden in his closet. Question 1: The street children in Bogotá are often referred to by locals as “los desechables” — the disposables. What do you think about this term being applied to any people, children or adults? Question 2: Mateo was forced to fight with Colombian rebels when he was a teenager. Although he still carries the memories and scars of that time in his life, he knows God has forgiven him for the things he was forced to do. Do you still carry burdens from the past, despite knowing you’ve been forgiven? Question 3: Kayla is scared of Mateo Luis at first because she judges him on appearance alone. Once she gets to know him and looks at his heart rather than the scarred surface, she sees a man with a strong faith in God and deep compassion for street children. Have you ever judged someone or been judged by someone else based on appearance alone? What happened? Question 4: The night sky and the brilliance of the stars remind Mateo of God’s power and that He is in charge. What reminds you of our Creator’s strength? Question 5: Kayla and her friends spent all their free time one summer building houses for Habitat for Humanity. As Kayla said, “Enabling their dreams of having a safe place of their own to live was worth giving up all my free time.” Do you agree with Kayla’s statement? Have you ever sacrificed your free time to help others? Question 6: Mateo seeks God’s wisdom and guidance, but he doesn’t receive a clear answer. Carlos suggests maybe it is God’s way of telling him to wait. Has God ever told you to wait? If so, how did you handle it?